The Cessna Citation X (X as in the Roman numeral for ten, not the letter) is a long range medium business jet aircraft. The X is currently the fastest civilian jet in production with a top speed of Mach 0.92 (703 mph). This also makes it the fastest business jet in history. The Citation X is powered by two Rolls-Royce turbofan engines and is built by the Cessna Aircraft Company in Wichita, Kansas. The Citation brand of business jets encompasses six distinct "families" of aircraft. Although based on the earlier Citation III, VI and VII models the Citation X is a significantly different airplane. It utilizes a totally new wing design, engines, and features a glass cockpit. 1.7 When and how fast to descend? In order to effect the initial speed reduction, place the throttle in idle. As you deploy the larger flaps levels (15+) the aircraft can slow down quite quickly, and you will have to carefully use throttle and elevators to avoid a dramatic loss of airspeed and stall. Particularly for the full flaps extension it is very difficult to maintain sufficient airspeed to prevent fast descent so deploy these only when you are really close to the runway. Before the flight you should set the route in the route manager. 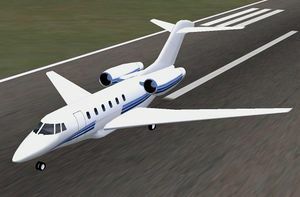 In the explanation it is assumed you are familiar with basic autopilot operation in the Cessna, although the Citation X autopilot differs in many aspects. This description is not an exhaustive description of the autopilot modes, but rather a summary that should be sufficient to get you started. The autopilot can be controlled either from the unit at the top of the instrument panel (marked in red), or from the dedicated GUI menu F11 (marked in green). The keys in the cockpit will light up according to which autopilot mode you are in - no direct visual feedback is associated with key presses in the GUI window but the actual mode is shown in the top of the window. The current horizontal and vertical mode are shown in the top part of the GUI window as well as in the top of the primary flight display (PFD, the left glas panel on pilot side). AP: engages/disengages the autopilot - this switch works as a toggle switch. On first engaging the autopilot, it will reduce the bank angle to zero and keep the pitch direction. You can adjust the pitch with the 'nose' up/dn wheel on the autopilot unit, or equivalently the UP and DN buttons on the GUI. It is no longer possible to control the attitude or climb and sink rate directly with the elevator as the autopilot will adjust the elevator trim to counter any movement of the yoke. HDG: turn into the direction set by the heading bug and follow it. 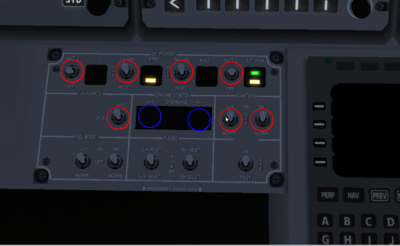 Although there is a cockput knob for adjusting this in the central console on both the pilot and co-pilot side, it is not practical to use unless you have multiple views enabled or use the autopilot GUI as you cannot at the same time operate the knob and look and its effect. So the best way is to use the GUI to set this. The current position of the heading bug is shown on the horizontal indicator in the centre bottom part of the PFD and as a number in the bottom left of the PFD. NAV: Navigation mode. Choosing the NAV source: For this you use the two buttons NAV and FMS in the unit above the PFD (marked blue) (or equivalent buttons in the GUI). NAV will select the VOR tracking mode (pressing it will toggle between tracking NAV1 and NAV2 receivers), and FMS will follow the flight plan defined through the route manager. Note that changing from FMS to NAV1 or NAV2 mode and vice versa will disengage all horizontal and vertical modes and put autopilot into standby mode. In the NAV mode the autopilot will intercept and then track the selected radial of the VOR station similar to a Cessna. The radial can be selected in the GUI, with the knob in the central panel or with the knob in the auxiliary HSI. Both HDG and NAV mode can be engaged at the same time - in this case the HDG bug will select the intercept direction. The HDG mode will automatically disengage when the autopilot turns to line up with the radial. In the FMS mode, the plane will fly from waypoint to waypoint, starting with the currently active one (the horizontal mode indicator then shows LNAV). FLC (Flight Level Change): In this mode a target airspeed is set (indicated as number above the air speed indicator in PFD), which the autopilot will match by lowering the nose if the plane is too slow, and raising it, when it is too fast. This mode will automatically disengage when reaching the target altitude. Conversely, if you are already flying at the pre-selected altitude (or have recently pressed ALT), then this mode does not even engage. VNAV This button can only be pressed if a route has been defined and the FMS mode has been selected. It will then follow the preset altitudes defined the route manager (again as flight level, i.e. in hundreds of feet). Watch out: if no altitude has been defined for a waypoint then a default altitude of 0 ft seems to be assumed. This might get you into serious trouble, of course. APP: Approach mode is supposed to first intercept and track localiser of ILS beacon, and then intercept and follow the glideslope. On my trials this resulted in unstable AP behaviour. BC: Back-course follows an ILS radial in the opposite direction (e.g. for landing from the opposite side). After I could not get APP to work properly I did not bother testing this mode. The CO and YD buttons are active buttons in the cockpit but do not seem to have any effect. When and how fast to descend? The following rules-of-thumb apply will give you a glide slope angle of 3 deg and are easily worked out using basic trigonometry. Click here for a review of the Cessna Citation X. This page was last modified on 3 July 2016, at 11:44.